Ivermectin is one of the active ingredients commonly used to control heartworms. It works by killing the heartworm microfilariae before they develop into adult heartworms. Yes, a poison that works to kill parasites. It works by causing the parasites neurological damage, resulting in paralysis and death. So you can see why not following exact dosage amounts and not under your Vet's guidance, you could harm or kill your Schnauzer. This is why you need a Veterinarian prescription for products containing this ingredient, such as Heartgard Plus Chewable. However, it is possible to purchase products from a feed store that contain the ingredient. And many people do just that. To save money! And saving money is fine... BUT you must know exactly how much of the product to give your pet in order to kill the parasites without harming your dog. You should ALWAYS talk to your Veterinarian before administering this product to your dog, as the most common causes of toxicity are due to improper usage and dosage amounts. Your dog should always be tested for heartworms before beginning any heartworm preventative treatment. 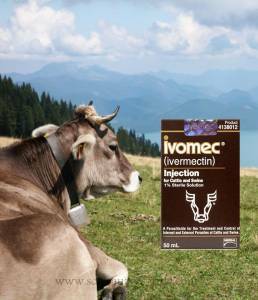 Ivomec for instance, is designed and packaged for cattle and swine, not for dogs. However, it is widely used by dog owners as a less expensive alternative because it is the same ingredient that is used in other parasite control medications for dogs (like Heartgard for Dogs). The trick however, is using the correct dosage for your dog and administering it correctly. So, if you plan on going this route, PLEASE discuss it over with your Veterinarian first. Again, it is a poison and improper usage could have devastating effects. note: Certain dog breeds (hearding breeds like Collies, Sheepdogs, and all crosses of these breeds) have shown sensitivity to Ivermectin and even a low dosage could show signs of poisoning. Always consult with your Veterinarian before using over-the-counter medicinal treatments on your pet. The following list is warning signs your dog has been poisoned. If your Schnauzer demonstrates any of the following behaviors, contact animal poison control and your veterinarian immediately. For example you can save 80% on pet medications & get free shipping by shopping at Total Pet Supply. They also have a 125% Price Match Guarantee! And they carry the most popular meds like Advantage, Frontline, Heartgard, K9 Advantix, Revolution and more.